1) Name the FC I hated the most out of every FC ever released. First person to name correctly gets a Top tier. If no one can guess it, low tier prize to closest guess. 2)Which do you think is my favorite blog post I made? Name it by the date/title. Same deal top if correct and first, low tier for closest. I will update this post as items starts leaving Here is list I compiled of stuff I have: You can also add in anything from my trade list. 1) So on Saturday, I picked up the news paper and saw this article. (just online version of it, I have paper version) I was so surprised to see an article with Allods in it, was screamed ZOMGZ!1!! 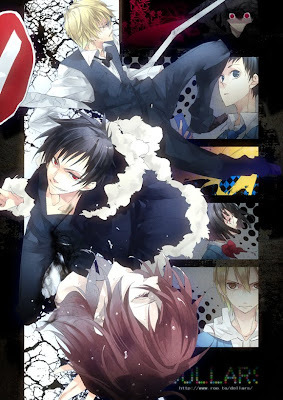 3) So by far my favorite anime this winter season was Durarara. Loved the surprise appearance of 2 of the main characters from Baccano (since same maker). Really enjoying this anime, only 2 more eps left. 5) So it took a while, but I found online radio for chinese music. For those that don't know real cantonese Radio is all talk shows. 9/10 are pure talking shows with last one being news So I was pretty ecstatic when I found this. It players canto, mando, and jap music but it's alright. So last couple posts were on Allods, but more randomness rather basic introduction/update about Allods. So as of right now our guild only has a couple people. Rho, Aaro, Force, Cherisia, Kaitri, Maho and me. Of the couple of us, 4 of us hit level 40 and we have begun our astral ship building (that will take at least another month or 2 to finish). As we wait for our astral ship, you get to do daily instance quests called Heroics to shorten your astral ship build time. Problem is we require a full 6 man level 40 team to do Heroics. Hence we decided to open up recruitment to find some fresh blood to help fodder for us in Heroics ^_^. Hopefully we can find some fresh meat to get up to 40 to help us in our end game content. Rho's theory on the recent "Community Spotlight"
You'll find the Spotlight here. "As part of our ongoing effort to thank our amazing community for all the time and energy they have put into making Allods a success we would like to dedicate this week’s Community Spotlight to some of the amazing Archetype Guides that our players have written and posted in our forums. These guides are extremely thorough, well written and offer a great deal of advice for both new and veteran players alike. Whether or not you are playing that particular archetype, or simply would like to get an idea of what your competition is up to, check them out and let the writers know what a great job they are doing!" Before we continue, let me take a moment here. So basically, in order to sound 'involved' the GMs decided to toss rocks and pick up some random guides in the forums and front-page it for the world to see. Unfortunately there were only six classes, I guess the rest of us are playing the wrong game; that or hackers are secretly adding content. Must be the content adding hackers again, CAN'T ANYONE STOP THEM?! As the title states, Rho has a theory. Now Rho's theorys aren't as well woven and deep like Pearz' so don't expect that, Rho can only pick up very obvious things within her frontal conal viewports. The GMs are front-paging trash guides in an effort to lower the overall competence of the Allods populace ultimating in more people dying and an increased average buying of perfumes! Why would I want to follow the guide of a Pally who decided his class was weak&underpowered and rolled a Healer in OB? So been quite a while since I last updated but I have a matter of great head desking. So today after an emergency maintenance there was an update in the item mall. They GM team prompty put up a thread to get feedback about it here. 1. The prices of cashop is to high, I should be able to buy everything in Item mall for a P2P subscription cost, $15. 2. Why was my thread censored by Gpotato and all you do is closed and told to post in official thread. The basic F2p model revolves around a larger player base and a smaller core of players that actually pay. To believe that you can buy everything for $15 is contrary to the whole idea of a F2P business model. If everyone that spent money only needed to spend $15, who is supporting those people that aren't paying? So apparently spending 22 dollars reskilling and restating = your SUPER RICH. Seriously, how old are these kids to believe 22 dollars is the end of the world? You can't even ride like 2 blocks in a taxi for that money............. let alone all the drinking you may have done to warrant that need for a taxi. lulz. This guy cracks me up. Brings up math then talks about rounding? Math has always been about precision and at MOST rounding the final answer. Rounding when convenient for him, what amazing math. So all in all, kudos to GMs, if I had to deal with these people as a job, I would be pulling all their personal information from their accounts going to each of their houses and raise the average IQ of the world 1 person at a time.